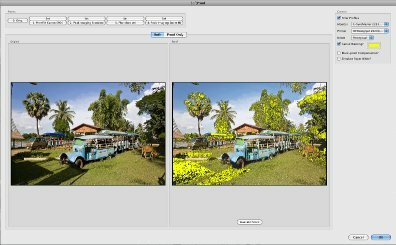 Many people have been asking Adobe to add softproofing to Lightroom since version 1 was released. With Lightroom 3 now available still without softproofing, this needed to be added. Softproofing is a preview of what a photo will look like when printed out using an ICC profile. Typically you will be given ICC profiles with high-end printers, or perhaps generate them yourself using products like the Spyder or ColorMunki. Each printer will have different characteristics, which will be different again for each type of paper and ink you use. Online printers, even though many will say they request sRGB, will also have different output for the same reason. If you have an accurate ICC profile for both your monitor and your printer, even if that printer belongs to an online photo printing company, you can see how your print is likely to look without going to the effort and expense of printing test photos. If you need full-size screenshots for a web-site (or print) review please contact me. Genuine reviewers can request a full license. Without a license, the proofed images will be at very low resolution.